We are intrigued by the various 2019 food trend predictions, such as those from the New York Times on the the new "It Cuisines" -- Eastern Mediterranean, the Stans (Kazakhstan, Tajikistan and Uzbekistan), Pacific Rim, and flavours of Africa. Here on the West Coast, Pac Rim inspired dishes are certainly not new, though we're delighted to see they are supposedly trendy. One of our favourite Pacific Rim chefs, Roy Yamaguchi, has a fantastic approach to cooking that he describes as bold Asian flavors, classic European techniques, and the freshest local ingredients to create, "Hawaii Inspired Euro-Asian Cuisine". We're inspired by his style and have adapted one of his signature dishes, wood-smoked Szechuan style baby back ribs, with a Canadian/Okanagan twist. 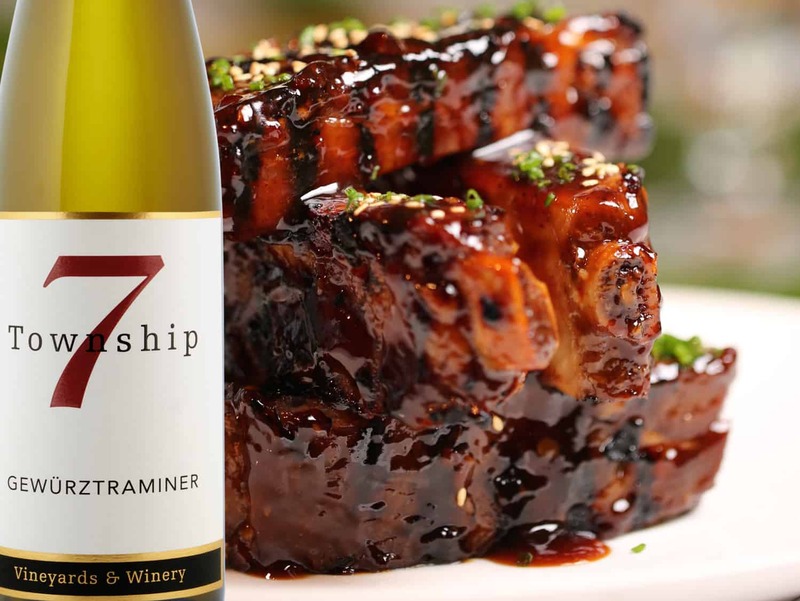 Sticky, chewy, sweet and sour, this lip-smacking ribs recipe is impossible to resist with our 2017 Gewürztraminer. The 2017 Gewürztraminer is a clubSEVEN exclusive, which will be included in the upcoming spring shipment to our wine club members. Crafted in a dry Alsatian style, this vintage is as beautiful to the nose as it is to the palate. It was recently honoured with a 92 point score by Canadian wine critic Rick VanSickle. Slice ribs into 2 or 3 rib portions. Place in a large saucepan. Add wine and enough water to cover ribs. Bring to a boil. Reduce heat so the liquid boils gently. Cover and cook until ribs are fork-tender, from 60 to 75 minutes. Meanwhile, in a small bowl, stir hoisin with garlic, ginger, soy sauce, maple syrup and oil, mix well. Stir in chili-garlic sauce. When ribs are tender, drain well. When ready to barbecue, oil grill and heat to medium. Brush ribs with sauce and place on the grill. Barbecue, turning and basting often with sauce, until well glazed and hot, about 15 minutes. Wonderful with steamed broccolini and Jasmine rice.